A year ago, a group of 14 French and German economists joined forces with the aim of forging common proposals for euro area reforms. Their report gave rise to a lively discussion among officials and academics. This column summarises the group's proposals and also addresses some of the points raised in a subsequent Vox debate on the topic. The ‘7 + 7 group’ saw the discussion over trade-offs between German-inspired responsibility and French-inspired solidarity as essentially pointless as long as the solution set under discussion remained situated inside the efficiency frontier. There was, in our view, room for simultaneous improvement on bothaccounts. Our joint report of January 2018 (Bénassy-Quéré et al. 2017) advocated reconciling “fiscal prudence with demand policies and rules with policy discretion”. Claiming that “market discipline and risk sharing should be viewed as complementary pillars of the euro area financial architecture”, we put forward a series of proposals (Box 1). The gist of the report was not endorsed by the French and German governments. France was uncomfortable with the acknowledgement that debt restructuring had to feature as a last-resort option, because it feared being dragged into accepting some form of automaticity. Germany was politically unhappy with the emphasis on a European deposit insurance scheme and had reservations about the proposal for a stabilisation fund, whose functioning would involve at least temporary fiscal transfers. The report, however, gave rise to a lively discussion among officials and academics, and a debate opened up here on Vox that has attracted many contributions. Selected controversies are summarised below. See also CEPR Policy Insight No 95, "Euro area reform: An anatomy of the debate", by Jean Pisani-Ferry, available to download here. The 7 + 7 group did not emphasise legacy problems but ideas for a better permanent regime, conceived in such a way that was intended to allow countries with high public debt or weak banking sectors to take part in it. An alternative strategy would be to start by addressing the legacy issues head on, through some sort of stock operation (a debt work-out and the cleaning up the bank balance sheets) even at the cost of accepting a degree of mutualisation. According to Lars Feld, it is preferable to show a limited amount of solidarity to restore national fiscal space now and to make the Maastricht system viable again than to commit to open-ended solidarity in the future (Feld 2018). Our proposals, however, are not simply – or even primarily – intended to find a way around the present lack of fiscal space. They aim at addressing systemic weaknesses in the Maastricht system that were revealed by the crisis. Furthermore, the political feasibility of trading off one-time solidarity for a return to the prior fiscal discipline regime is questionable. Even in the case of Greece, no agreement has been found to proceed to a genuine stock operation and to get rid of the long shadow of the past. To put it simply, states’ revealed preference is to avoid paying now. Debt restructuring should be considered as a last-resort optionfor insolvent sovereigns. The no-bailout rule – that is, the principle that the ESM does not lend to an insolvent state – would be upheld exactly in the way the same principle is implemented by the IMF. Debt restructuring should be made less disruptive financially and economically. This would be achieved by better protecting the financial system from sovereign risk and by introducing ‘single-limb’ collective action clauses (that allow creditors to pass a single vote on a restructuring proposal and avoid blockage by hold-outs). Some contributors to the debate (De Grauwe and Ji 2018) argue that it is impossible to decide whether a government is actually insolvent and that the very existence of a sovereign restructuring procedure may trigger panic. This is a fundamental debate. The no-bailout rule, one of the core principles of EMU, prohibits official lending or indirect central bank support to an insolvent state. To renege on this principle because insolvency is hard to diagnose in real time would amount to endorsing fiscal dominance. So, there is in fact no choice but to operationalise the principle that as a last resort, an insolvent sovereign must undergo debt restructuring. When and how it should be enforced is a matter of judgement. Guido Tabellini’s critique is more subtle. The 7 + 7 group explicitly stated that our proposals aimed at making a last-resort restructuring financially less disruptive and economically less damaging, and therefore a more credible option. Tabellini (2018) argues that this would be reflected in the risk premia applied to high-debt countries. The proposed solution would therefore impose a penalty on countries like Italy. For these countries it would not make things better, but worse. In a response, Jeromin Zettelmeyer and I acknowledge that for any given solvency situation of a country remaining in the euro area, the 7 + 7 group’s proposals would increase the probability of restructuring (Pisani-Ferry and Zettelmeyer 2018). We argue, however, that the solvency of the participating countries cannot be regarded as exogenous, but is likely to improve as a result of the proposed policy regime through stronger incentives to fiscal responsibility and the weakening of the perverse loop between banks and sovereigns. We also argue that providing for orderly restructuring inside the euro area may well reduce the probability of an insolvent country being expelled from it. This should diminish the currency redenomination premium priced on the bond market. Oddly, the 7 + 7 report has been criticised for not addressing this redenomination risk. It is true that in the report, it is mentioned only once. But as explained by Farhi and Martin (2018), one of our important aims was in fact to address and diminish it. The report adamantly advocates resolving sovereign debt crises through restructuring inside the euro area rather than through exiting from it. Indeed, the reduction of the cost of restructuring the report called for would logically diminish the threat of exit. Furthermore, proposals to break the ‘doom loop’ for good (through concentration charges on bank balance sheets, a common deposit insurance and the introduction of a safe asset) would help contain the risk of self-fulfilling exit expectations. The Maastricht policy assignment was remarkably clear and simple: reflecting the consensus of the time, monetary policy was regarded a strong enough instrument for addressing area-wide shocks whereas, provided governments played by the rules, national fiscal policies were supposed to enjoy sufficient margins of manoeuvre within the constraints of the SGP to tackle country-specific shocks. These hypotheses have been seriously questioned by the economic developments of the last decade. Contrary to the view of the early 2000s, fiscal policy is increasingly regarded as a necessary complement to monetary policy, especially in situations when the latter is constrained by the zero lower bound; and market reactions, or the fear of them, can prevent national fiscal policy from playing its stabilisation role when a country is hit by a large shock. Hence the need to reconsider the role of fiscal policy in EMU. The 7 + 7 report aimed to provide a response to the second problem by proposing a fiscal stabilisation scheme based on the evolution of employment or unemployment indicators. It would take the form of a fund, financed by national contributions, that would provide one-off transfers to countries experiencing a sudden and large change in employment. Many commentators generally regarded the stabilisation proposals of the 7 + 7 report as positive, but insufficient. Several would have liked the report to propose either a proper budget or a central fiscal authority capable of monitoring and steering the aggregate fiscal stance. This would also address the first problem – that of the aggregate fiscal stance. The challenge here, however, is not to demonstrate that the euro area would be macroeconomically better off with a common budget. It is to overcome either one of two major obstacles: the fact that coordination is toothless whenever it comes to telling a surplus country that it should relax its stance; and the fact that a proper budget requires agreeing on the common public goods, revenue, and accountability procedures. 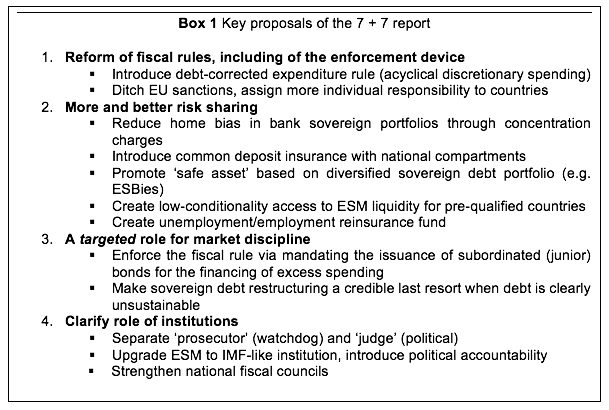 As far as banking union is concerned, the 7 + 7 report advocated (i) concentration charges so that banks exhibiting (home) bias in the composition of their sovereign bonds portfolio would be required to post more capital (but no risk-weighting of individual assets, which implies that all sovereign bonds would continue to be treated in the same way); and (ii) a common deposit insurance scheme that would guarantee all bank deposits equally but for which banks would continue paying different fees depending not only their specific risk, but also on the safety of the national banking systems. Concentration charges would primarily affect countries, such as Italy, where banks have behaved as the residual buyer of domestic government securities. In order to avoid destabilising corresponding bond markets, the 7 + 7 report advocated a gradual phase-in of concentration charges and a grandfathering of existing holdings, and it considered the introduction of a sovereign bond-backed safe asset. Despite having been endorsed by the European Commission and the European Systemic Risk Board, SBBSs remain controversial and that they are especially unpopular with debt management agencies. They were discarded out of hand in the Franco-German roadmap of June 2018. As pointed out by Zettelmeyer and Leandro (2018), there are three main reasons for this distrust: first, the fear that the senior tranche would lose safety in a crisis; second, the fear that in adverse market conditions, the issuance of synthetic securities could be blocked by the lack of buyers for the junior and mezzanine tranches; and third, the potential spillovers from the synthetic asset on the demand for national bonds and the liquidity of the corresponding markets. Simulations by Zettelmeyer and Leandro (2018) suggest that these fears are not without rationale but that they are largely exaggerated. As Frieden (2018) points out, any reform programme for the euro area must address the concerns of both core and periphery countries. Though they intended to help unlock the French-German discussion, the 7 + 7 group endeavoured to propose solutions that would suit all euro area members. Several contributors, however, implicitly regarded our report as unbalanced and biased towards the perspective of Northern member states. The critique was most explicitly formulated by Tabellini (2018) who argues that the compromise found by the 7 + 7 group is not suitable for a country exposed to the risk of a debt run and that its proposals would in fact increase the vulnerabilities of countries with high legacy debt. Tabellini’s argues that the 7 + 7 group’s obsession with breaking the doom loop is a bad idea in the first place. He claims that through acting as residual buyers of domestic sovereign bonds in situations of stress, national banks play a stabilising role that should not be hampered by concentration charges or other provisions aiming at the same goal. This is in fact a fundamental critique of the direction taken by EMU reforms since 2012, when the heads and state and government decided to opt for banking union. If domestic banks are to remain the safety valve of the sovereign bond market, it is fully rational for the markets’ assessment of their solvency to be correlated to that of the sovereign. This in turn creates a major conduit for overreaction in times of economic stress and elevated risk aversion. Some have also criticised the 7 + 7 report for what it does not address: chronic external surpluses or deficits, structural divergences in growth, and endogenous boom-bust cycles. The authors of the report are certainly the last to deny that these are major issues for the sustainability of the euro area. But concerns about them should not prevent serious discussions about the flaws or vulnerabilities policy system. With the 7 + 7 report, we were aiming at breaking the deadlock in Franco-German discussions and at changing the broader policy conversation on euro area reform. It is fair to say that we had limited success on the first point. We had more success with our second aim. Within the group of economists who participated in the endeavour, there is no longer a German position and a French position. All the 7 + 7 group stand by what we have proposed. Nobody can claim anymore that French and German economists behave as the prisoners of their respective national crisis narratives. This is not a minor achievement. Furthermore, the report has served as a reference point for a much-broadened discussion among policymakers and academics. Through its questioning of the relevance of well-established quarrels and because it has put forward new options, it has helped to break the status quo bias that is so pervasive in European policy discussions and to clarify which ideas command wide consensus and which remain a matter for controversy. Some feel that the 7 + 7 group’s proposals are insufficient, some that we have gone too far, some that we have taken the wrong direction. But such controversies are definitely useful. Bénassy-Quéré, A, M Brunnermeier, H Enderlein, E Farhi, M Fratzscher, C Fuest, P-O Gourinchas, P Martin, J Pisani-Ferry, H Rey, I Schnabel, N Veron, B Weder di Mauro and J Zettelmeyer (2018), “Reconciling risk sharing with market discipline: A constructive approach to euro area reform”, CEPR Policy Insight No 91. De Grauwe, P. and Y. Ji (2018), “Financial engineering will not stabilise an unstable euro area”, VoxEU.org, 19 April. Feld, L. (2018), “Wither a fiscal capacity in EMU”, VoxEU.org, 30 July. Frieden, J. (2018), “A plan to save the euro”, VoxEU.org, 23 May. Tabellini, Guido (2018), “Risk sharing and market discipline: Finding the right mix”, VoxEU.org, 16 July. Zettelmeyer, J. and A. Leandro (2018), “Beyond ESBies: safety without tranching”, VoxEU.org, 1 June.